There are a myriad of obstacles that can block our path to feeling truly satisfied with our lives. Occupational choices that no longer fit, untenable relationships, painful work-life contexts, to name a few. Tolerating those impediments, coupled with not being true to ourselves, is a path to distress and unhappiness. I believe a way to higher levels of contentment can begin with changing how we are doing and being in our daily lives so that decisions and choices consistently fit with who we are at our core. To allow this to happen, we must learn how to become more Essence driven, regardless of what others may think, which is typically the case if we are predominantly Ego driven. Recognizing the difference between the call of our Essence and the voice of our Ego can be perplexing, however that awareness can also be life giving. What's meant by the term essence? A definition: "intrinsic, fundamental nature or most important quality (of something); essential being." The terms Essence and Soul are typically used interchangeably. The ego is the seat of intelligence and rationality within our consciousness. It is the part of us that is in contact with the external world. The healthy functions of ego include recognizing what's taking place outside of ourselves, setting boundaries, differentiating and developing self-esteem and self-worth. Developing a healthy ego from early childhood is a prerequisite for producing a psychologically mature adult. The person whose ego is underdeveloped or fragile often finds it hard to cope with life. An inflated or overdeveloped ego can also be an impediment. Either extreme can hinder wise choices and good decisions. The healthy functions of ego are more likely to emerge with Essence (Soul) as our guide. 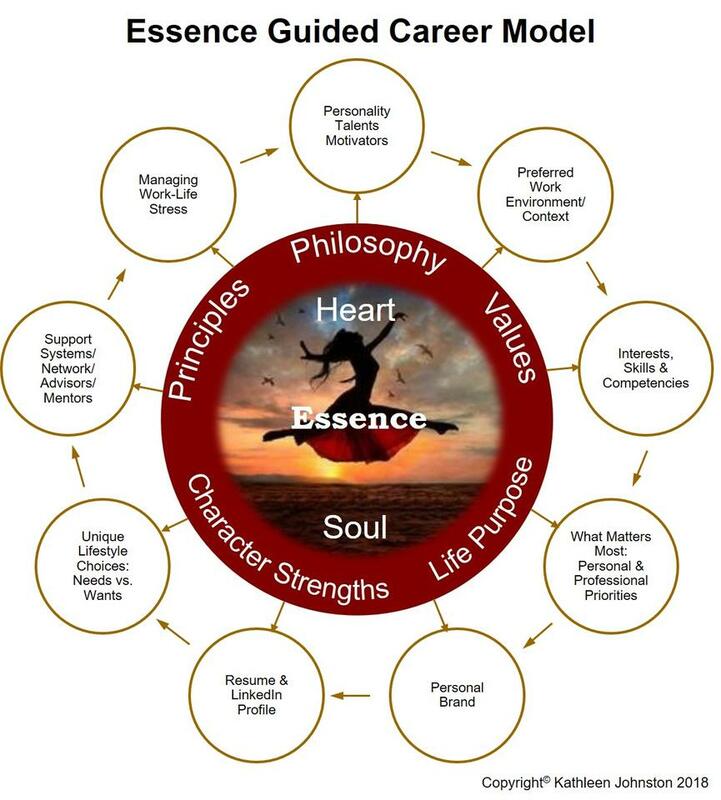 An Essence Guided Career Model is depicted above with exercises, techniques and a process designed to support and sustain meaningful work and high levels of life satisfaction. The terms listed in the red circle: Life Purpose, Character Strengths, Philosophy, Principles, Values connect the person to her Essence. The outside circles contain factors that need pondering, awareness and insight in order to inform wise choices. Completing the whole process acts as a guide for making viable education, training and occupational decisions at any point in one's career-life journey. What changes might you need to make in 2019 for Essence to be your guide? I'd love to hear from you.